Google just announced that Google Classroom is now available for all users with a Google account (click here for the post). While creating a class is still not an option (see picture below), users can join a class. This is great news for after school clubs, weekend classes, workshops, etc. This opens up a great piece of technology to people who want to learn and allows them to stay connected and collaborate. 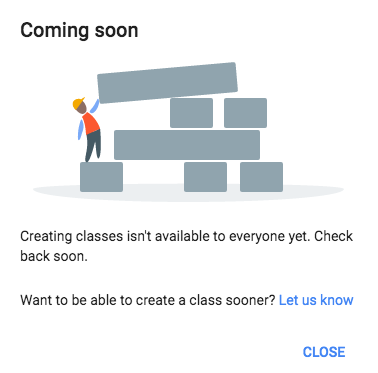 If you are interested in being able to create a class in classroom, let Google know by clicking here and filling out a Google Form.